The ultimate tv dinner? | dash.drizzle.dollop.devour. Cheese isn’t a food that I really think of as being particularly seasonal. While so many ingredients ebb and flow from my kitchen with the seasons, cheese remains a constant, a reliable friend in the fridge. 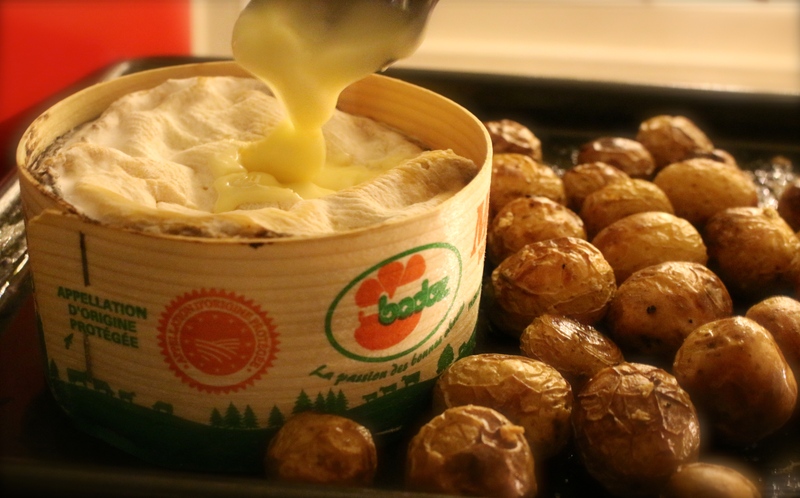 So maybe its the fact you can only get it for a few months each year that makes Vacherin a special treat. Not to mention its fabulous oozing texture and deep, almost nutty taste. One to snap up while you can and savour before it disappears again for the summer. Such a wonder ingredient wants for very little. No playing around, just let the cheese be the star. For a simple, yet extravagant feeling supper, I part boiled for 5-10mins some mini potatoes, whole with their skins on. The sort of size you’d want to spear with a fork and dunk into some cheese. Then drizzle over some olive oil and roast in the oven on about 180C for 30mins until crisp and brown. Sprinkle with sea salt and a little crushed garlic then pop back into the oven with the cheese in its box for another 10-15mins. After this time the cheese will have warmed through and become even runnier, ready to voluptuously smother the potatoes. Serve with a nice glass of port, a roaring fire and a good film.